I’m excited for the new Spider-Man movie. I thought Tom Holland really nailed the Peter Parker role in Captain America Civil War. Robert Downey Jr. is always entertaining as Tony Stark and I love the casting of Michael Keaton as Vulture. The action and special effects look great. It looks like Marvel is trying hard to weave Spider-man in with the rest of their cinematic universe, which is terrific. Really helps to build the anticipation for Avengers Infinity War (which Spider-Man will be a major part of). The only thing the traditionalist in me is uncomfortable with is Marisa Tomei as Aunt May. 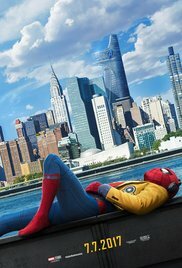 Aunt May has always been more Golden Girl-ish and Marisa Tomei brings a little too much hotness to the role, but this could make for some funny dialogue with womanizer Robert Downey Jr.
Spider-Man Homecoming swings into theaters on July 7th, 2017.